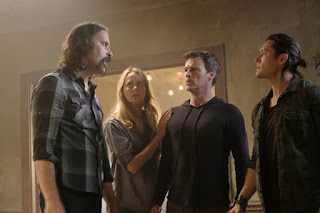 Last week on The Gifted, Reed, and Polaris were able to escape the custody of Sentinel Services, thanks to the efforts of Reed Family and the Mutant Underground. However, the prison break didn’t go 100% as planned. Sure, they got out to safety by the skin of their teeth, but they also learned that Sentinel Services are also employing mutants to fight other mutants, as John’s former best friend Pulse was now working with them, using his scrambling power to temporarily depower them. Because he lost custody of Polaris and Reed, Agent Turner promised fire a fury against all mutants as a result. This week continues the troupe of opening with flashbacks. This time we peer into the Agent Turner’s past. Long before he was a cutthroat agent of Sentinel Services, he was a simple cop who enjoyed days at the park with his wife and young daughter. Then, of course, July 15th happened. Thanks to Turner’s flashback and a little bit of exposition in this week’s events, a peaceful mutant rights protest turned deadly and powers were unleashed, which causes Turner’s poor girl to get caught in a blast. You can see why he has a problem with mutants and would volunteer to chase them down. An in this week’s episode, boy does he chase them down. When everyone makes it to the Mutant Underground headquarters, it’s overrun with fellow mutant fugitives. It looks like he’s cracking down on all mutants who have been in hiding. Any suspected safehouse was getting overturned by Sentinel Services, overworking the Mutant Underground. Not only are Eclipse and Polaris away trying to avoid drones, but the mutant who was shot in last week’s escape in badly in need of medical help. One off the mutants that have come to the headquarters is the bartender who can turn invisible, Fade. Last time he saw Reed, Reed was about to betray him and the poor mutants he was trying to coyote away. Fade doesn’t trust him, which is also sowing discontent within the ranks there. Reed knows he has to prove his loyalty and his prosecutor instincts kick in. 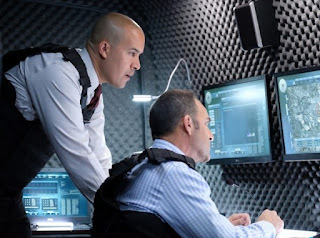 he first is able to break through the police scanner code to know that the authorities are still hunting for their headquarters, but he also decides that he has to volunteer his services to steer the police away. Ade is skeptical, but since John has built up a rapport with the family, he trusts him. But what happens if he gets caught? Well, Dreamer can remove his memory of having been there. This is something that Blink overhears and picks up on immediately. In the meantime, Caitlin, Laura, and Andy tend to the injured mutant. Caitlin being a nurse does her thing to help stabilize the patient while her children play as her assistants. Any being a universal blood donor then helps out. After removing the bullet, Lauren uses her powers to help stop internal bleeding while Caitlin sows him up. Yay for the Struckers helping out. The bulk of the episode focuses on Eclipse, Polaris, and agent Turner. Turner set up a roadblock which Polaris uses her magnetism to overpower the guards and takes Turner hostage. They head to a nearby abandoned building where they interrogate him as to how Pulse came into working for the Sentinel Services. What do they have that would make a mutant betray his or her own kind? Not wanting to stoop to Turner’s level of torture, they go for the next best thing: Dreamer. After Blink teleports Dreamer to the warehouse, she uses her powers to view Turner’s memories. Blink sees this and is able to put two and two together that her memories of loving John were a result of Dreamer invading her memories, something she will not forgive or forget. While inside Turner’s mind, Dreamer learns about a new government building as well as a special brand, the same one Pulse was wearing. However, before she was able to dig deeper into Turner’s mind, his fellow Sentinel Service agents break into the building to rescue him. Just as Dreamer was getting ready to find out more information, they have to go and her connection to his thoughts are cut short. When Turner comes home to his wife after what she knows was a tough day, he tells her he wants to tuck their daughter in for bed, the same daughter that died in the July 15th attack. Dreamer erased his memory of his daughter dying. His distraught wife has to tell him that his daughter has been dead for four years. He, not having any memory of it, is like the first time she dies all over again. The episode ends with him embracing his wife in their shared pain. Next week, the Mutant Underground has to become the new X-Men, and that means training. Without a Danger Room, the headquarters will do.